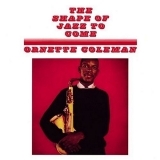 The Shape Of Jazz To Come is ranked as the best album by Ornette Coleman. Members who like this album also like: Kind Of Blue by Miles Davis, The Black Saint And The Sinner Lady by Charles Mingus and Mingus Ah Um by Charles Mingus. Related links: top tracks by Ornette Colemantop tracks of the 1950s, top tracks of 1959. Showing latest 5 ratings for this album. | Show all 380 ratings for this album. Uma viagem absolutamente moderna para sua época. I love the conversational tone of the melodies and improvisation. The cornet and bass also do really well to fill the place of the piano on this album. One of my favourites in jazz. One of the masterpieces of modern music. Not too far behind of Stravinsky or Debussy in compositional merit. Simply, a 14/10. One of the greatest jazz albums ever. The shape of jazz to come, is quirky, challenging, and still sounds totally fresh after all these years. The album has a musical theme running through it's playing time that gives you a sense of familiarity as the music shifts from one place to another. A beautiful and courageous jazz album that is utterly timeless. It's cool to hear the musicians kind of chasing each other's musical ideas, but there's not enough substance here for me to love it.